The cantata Les elfes (The Elves,1887) on a text by the French poet Charles Marie Leconte de Lisle (1818-1894) marks the end of a seven-year period in which Diepenbrock produced thirteen songs and six many-part vocal settings (three of which with piano accompaniment). On the one hand this cantata is the culmination of Diepenbrock’s development as a young composer, on the other, it is a first step towards a world he has not yet explored: the orchestra. We do not know how he took up this challenge in his earliest score, as the manuscript of 1887 has been lost. It was not until the autumn of 1896, after composing three choral songs with orchestral accompaniment from Vondel’s Gijsbrecht van Aemstel (RC 30, 31, 33; 1893-1895), that Diepenbrock wrote a new version of Les elfes. During a visit to Liège he played this version on the piano for his colleague and friend, the Belgian composer Charles Smulders (1863-1934), for appraisal. Although Smulders was positive about the music and orchestration (BD II:468), Diepenbrock laid the work aside after completing the piano transcription in February 1897. Diepenbrock never revised the work. Sera notre lit de noce, dit elle. The poem opens with a refrain which is repeated after each stanza: “Couronnés de thym et de marjolaine, / Les elfes joyeux dansent sur la plaine.” (Crowned with thyme and marjoram joyfully the elves dance in the field) In Diepenbrock’s composition this refrain has both a structural and a dramatic function. As a self-contained, independent musical unit it constantly gives an impulse to the basic idea behind the entire composition: a continuous rocking motion based on the text. Four out of the seven times this refrain is sung by the female choir, the setting is almost identical. 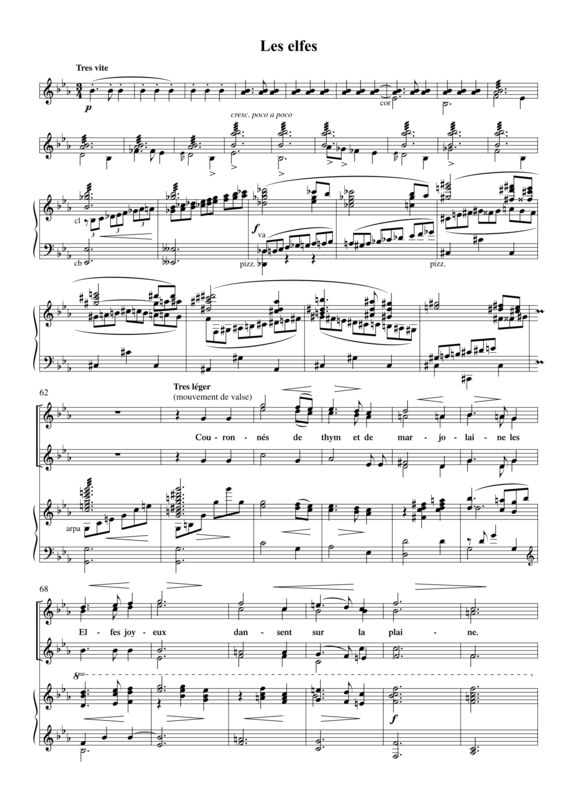 But whenever the following stanza describes a dramatic turn of events, the composer manipulates the setting in such a way that a new key is introduced and a new musical-dramatic context is created. This is also the case in the final refrain, which modulates back to the key in which the orchestral introduction started. Throughout the work, the orchestral accompaniment provides a shimmering backdrop, against which right at the beginning of the introduction a horn plays a chromatic melody that circles around the tonic. This melody reoccurs everywhere where danger – be it direct or imminent – is voiced in the text. To compensate for the fact that there is no other independent musical material, throughout the work the two thematic ideas are confronted with each other in a continuous succession of contrasting keys with additional chromaticism and modulations characterised by relationships of thirds. The two vocal parts for soprano and baritone seamlessly blend into this musical stream as a counterpoint. Especially the final dialogue between the elf queen and the knight has some terrifying moments. Seldom has the music of Wagner’s Tristan and Isolde had such an all-pervading influence on Diepenbrock as in this work. However, the content and music of Les elfes have more in common with Gustav Mahler’s cantata Das klagende Lied (The Plaintive Song, 1878-1880), a composition Diepenbrock only heard for the first time in 1906 (in the arrangement of 1898) and which greatly affected him (see BD V:110). Could it be that getting to know this cantata was one of the reasons he decided not to make Les elfes public? Certainly, in 1906 the discrepancy between this work and Diepenbrock’s more recent compositions, both musically and stylistically, was much greater than between Mahler’s juvenile works and his works from around 1900. However, this by no means diminishes the merits of this inspired composition. – Elfe, esprit, démon, ne m’arrête pas! Ne m’arrête pas, fantôme odieux!